Forward auctions take the form of a single seller offering an item for sale and buyers competing to secure the item by bidding the highest price to win. Set event time to start immediately or in the future based on mins, hours or days. Set the hidden price that bidders don't see to ensure you reach the desired price for the item listed for sale. Buyers enter the highest maximum price they are willing to pay for an item and the system bids on their behalf up to the max desired bid amount. Stop auction sniping where buyers attempt placing a bid to exceed the current highest bid as late as possible—usually seconds before the end of the auction. Review all bids placed and the time they are placed including manual and auto proxy bids. Set up bid increments tohelp the marketplace increase the current bid price after each bid is placed. Drive incentive by offering shipping discount option for sellers to give buyers when purchasing multiple items to be shipped. Flexible shipping options allow buyers to save and use new shipping addresses in case the item purchased is a gift. Based on location, ILance will automatically calculate and display major country and state tax rates. 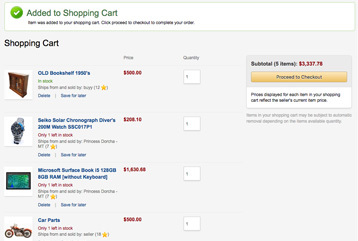 Your customers can easily add items to their cart from various sellers and can save to purchase later. 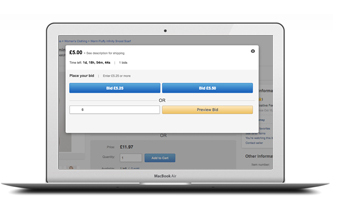 Set up multiple payment options for buyers to choose during checkout. Number of items in stock will appear for buyers to take action and proceed to checkout their cart. Notifications shown to buyers if items don't ship to their location or if items of multiple currencies are added to cart. Provide realtime payment methods from gateways that take the customers credit card without leaving the marketplace. 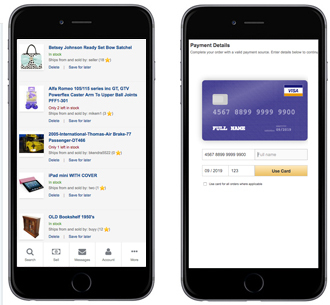 Provide payment methods from gateways that take customers out of your marketplace to pay, like PayPal. Provide customers will information to pay outside the marketplace using cash, money order, check, etc. When enabled Escrow funding is between the site owner and the person funding an escrow account for a listing in the marketplace. People funding Escrow accounts will need to deposit funds first. Turn on the Bitcoin currency and let customers buy and sell with the world's most popular cryptocurrency available today! Use the ILance app on your smartphone to update your store, manage inventory, fulfill orders, and contact a customer. Site owner merchant account will be the payment processor. A virtual account balance credit will be applied to sellers where buyer orders are successful. Sellers can request a withdrawal from their account balance. 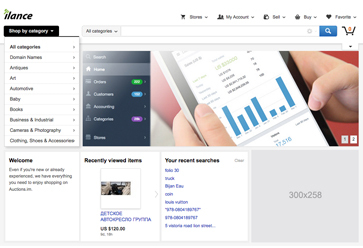 Showcase your marketplace with the power of search engines. 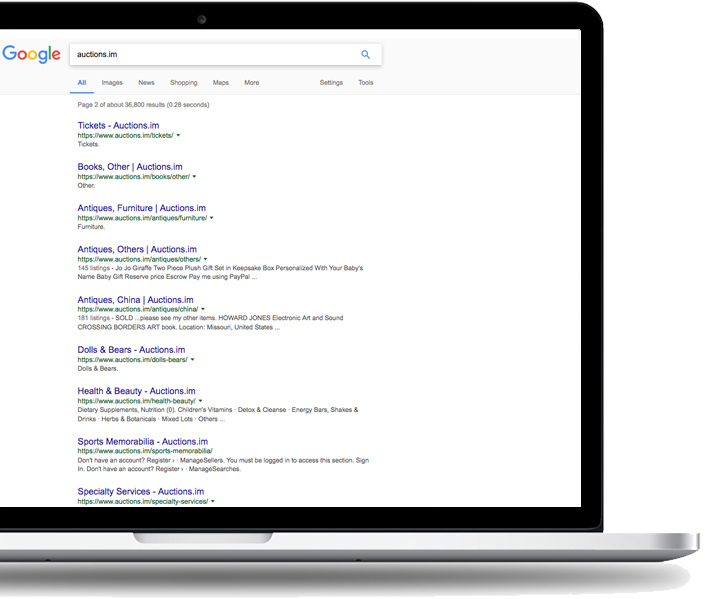 ILance focuses on SEO latest strategies for clean urls like customizable category titles and keywords and more. Track web vistors and activity through Google Analytics by entering the code provided to you when joining their program. This code will attach to the footer page of the marketplace. Instantly register with Google, Twitter, Linkedin and Facebook, share listings and more. Integrate your Google adsense ads into anywhere in the marketplace. Engage more traffic across the globe by offering your marketplace in multiple languages. Bulk email your customers of upcoming offers or site announcements. Know who is browsing the Marketplace, keep track of sessions, search crawlers, user locations and source of device and browser origin. Set up membership plans and charge a fee for buyer and/or sellers to use the marketplace based on access permissions charged daily, monthly or yearly. Create levels of fees in the form of flat rate or % and assign per category to invoice the seller after a successful sale. Set a fee that sellers can pay to feature their listings shown on the homepage and search or pay to highlight and/or bold their listings. You can also charge sellers for each picture uploaded as well as fees for the use of "Fixed price" or "Auction format". Charge a fee to the seller for the posting of uploading products for sale. Include a separate fee to the payer or payee (or both) for the processing of incoming and outgoing transactions of the built-in Escrow between the buyer, seller and site admin. Include additional fees for processing withdrawls and deposits whereas you may charge 3.5% for incoming deposits from multiple sources (PayPal, Wire Transfer, Credit Card, Cash, Check and so forth). Apply your own design aspects such as logos, color, font, text, layout and build your brand. Upload product related image banners in rotation to help your customers find products and learn more. Branding removal feature allows you to replace the ILance company copyright statements with your own powered by statement. Easy to access mobile menus direct you to all major tools in the marketplace for accounting, searching, and more. Works across all major mobile tablets and devices using a smart responsive design that's not only consistent (Mobile view vs Desktop) but includes XML-RPC support to allow native mobile applications to interact with the marketplace. Register as a guest, add to cart, checkout and pay for products from anywhere.